Like Goldilocks' search for the perfect porridge, chair and bed, citizens in Pelican Rapids were looking for a playground that was "just right" for their littlest children. Child care providers and parents were finding the current equipment too big for little hands and feet, and in some cases, too dangerous. But now there's a new play area in E.L. Peterson Park that is designed specifically for children ages 2-5. And it took a whole community pitching in to help make it a reality. The WCI-supported Pelican Rapids Early Childhood Initiative spearheaded the project. They worked with city officials to plan the new play area, and helped raise $8,000 through private and business donations. WCI processed the donations. The local Jaycees provided volunteer labor to assemble the equipment. 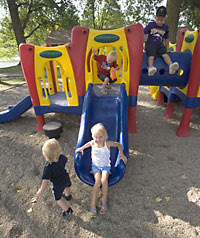 The new play area will be dedicated Sept. 13, from 4:30-6:30 p.m. Ice cream will be served. Don't know where E.L. Peterson Park is? It's right next to Pelican Pete.